Hi! My name is Barney, and right now I am living in cage C221. 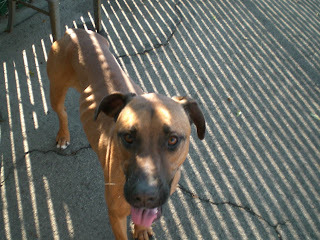 Susan the dog lady thinks I might be some kind of pointer/doberman mix. 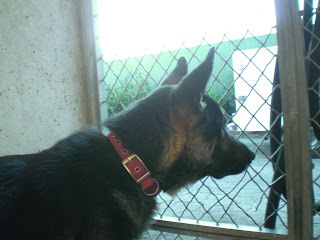 When Susan first tried getting to know me on Wednesday and tried walking me, I didn't like the training collar at all! I kept bucking like a bronco and kept trying to chew the leash. Susan wasn't sure if it was really hurting me or I was just being a brat, so she put a martingale collar on me just in case. I didn't complain with the martingale, but Susan noticed I was pulling on it. She also noticed I barely felt any correction when I growled at the ducks in the back. So Susan thought about it and decided that next time she would try the training collar on me again. 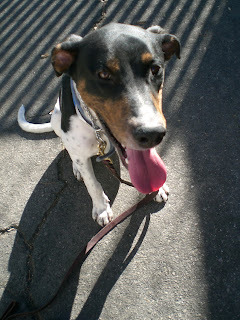 On Friday the 29th, Susan walked me with the training collar again. I tried chewing the leash but I was just getting a mouthful of metal and she kept yanking it away. I tried jumping a few times too but she kept stepping away and wouldn't do anything. However, if I quietly sat, she'd step in and give me a rub and maybe a chicken treat! So, I think I'm learning that jumping and bucking get me nothing, walking and sitting get me chest rubs and pats and chicken treats! 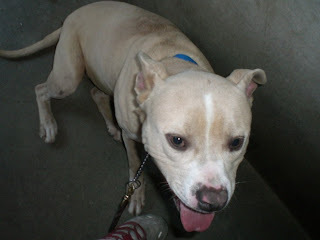 Susan actually walked me around the shelter a few times and said I was much better today! 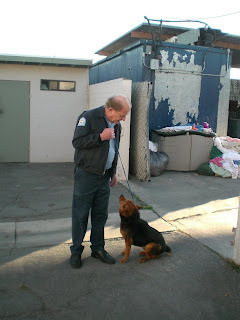 Nobody knows my name, but since I am winning popularity contests here at the Carson shelter, Chuck, a shelter employee calls me Dollbaby. Susan says I am Chuck's girlfriend. They think I am a sharpei mix with maybe some Jindo. I just love everybody here. Susan doesn't know my impound number at the moment, but right now I am being held in a court case. 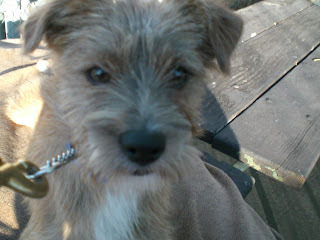 I was brought in with a boxer and a German shepherd because of biting. The shelter employees think it was the German shepherd who did the biting and the boxer and I are just getting a bad rap. It's unfair, but these things happen all the time - a dog getting blamed for something he or she didn't do. That's me with Chuck in the first picture above. Then Chuck asked me to look at Susan, which I did - that's in the second photo below. Susan calls me King. 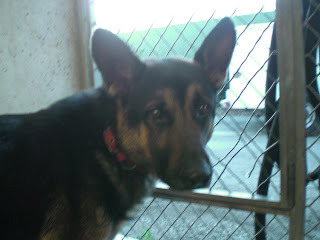 I am 2 year old male German Shepherd, brown and black. I was impounded on December 11, and I live in cage C337. On Monday the 18th, Susan was showing me to a nice man. She noticed I was scared, and that I cringed every time she moved her hands quickly near my head. When she put me back, I tried to bite her, but fortunately she moved her hand away in time. The man changed his mind about adopting me though. Today Susan came back to see me. She came with plenty of delicious chicken and liver treats. Whenever I let her touch me and pet me on the head and neck she would click and then feed me the treats. We played that game for a while. The treats were delicious! Then she dangled the training collar around my neck for a while, and as long as I didn't act scared, she'd click and feed me more treats. Finally, I just let her put it on me. By this time I was sticking my head in the crook of her arm, hoping she'd rub my ears. Susan took great care to give me a great neck rub and let me see her hands whenever she put on, removed, or adjusted the training collar. She took me outside for a walk and it was great to get a chance to relieve myself! We had a good time. I hope she visits again soon, and brings more of those treats! I like that game! Susan the dog lady calls me Creampuff because my coat is such a beautiful creamy color. 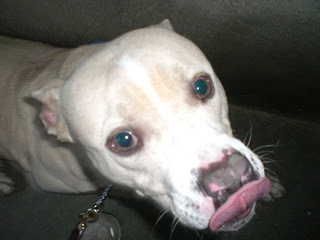 I am a 1 year old male pit bull, still a puppy! I live in cage C314. When Susan entered the cage I completely lost control because I was so wild with joy! I kept jumping and trying to get her attention, but she stood there like a pillar in one corner, with her face to the corner, arms tucked in. She wouldn't look at me even though I was jumping all over the place! Susan finally managed to get a chain on me and the leash attached, but I was still going crazy. In between my jumps I was trying to wash her hands with my tongue. So all Susan could do was stand on the leash to keep me from jumping so hard. Because I couldn't settle down, Susan decided not to try walking me. But she plans on coming back into my cage regularly to see if I can be conditioned to settle down quicker! I hope she comes back! Hi there, Marty again! 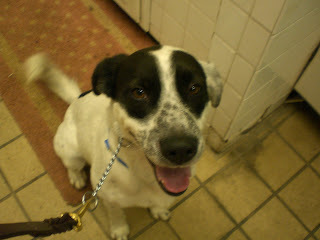 I am a 1 year old male dalmatian mix. I'm still a puppy! Right now I am living in cage C203. Today Rydecka one of the shelter employees told Susan the dog lady that I am very hyper. 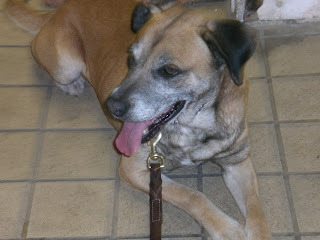 So Susan took me out today and walked me around the shelter about six times to try and defuse me! Susan did her standard trick of putting down the divider door, entering my cage on the other side, then raising the door and slipping my head through the chain. She stood on the leash to keep me from jumping, then had me sit and stay before we even got out of the cage. Susan made sure to use the training collar on me and I wasn't hyper at all! 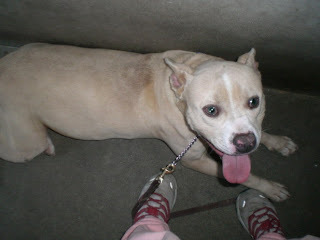 She walked me several times around the shelter. Sometimes she'd stop and make me sit during the walk. She also took me into the back play area and let me chase a furry squeaky toy. I am an exuberant dog and need a loving home. Will you come down to the shelter and adopt me? Hi, Susan the Dog Lady calls me Coco! 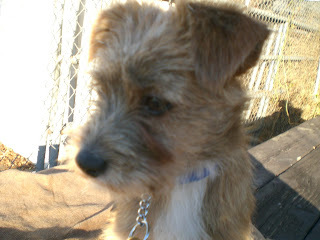 I am a young terrier mix. Today Susan found me in building 3 but I've been available for adoption so she moved me into cage C220 in building 2. 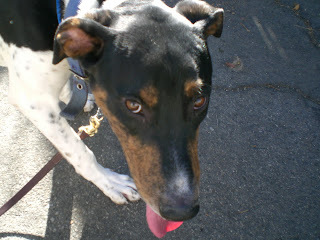 I am not disciplined and don't know how to leash-walk very well at all. I kept biting Susan's leash. 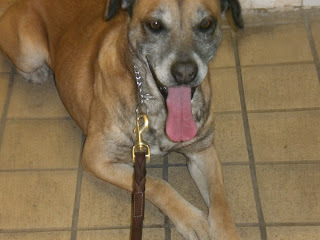 But Susan thinks I am extremely sweet and friendly and nice, and I didn't bark once while she had me out! So she thinks I'd make somebody a fantastic pet! Here are my pictures. It's so nice that Susan can get down here during daylight hours so she can take pictures of us. Hello Chance here! Susan the dog lady now has some time off work and she can come down here to the shelter and spend some time with us during the day! Oh boy! I have a problem popping off at other dogs so Susan has to keep my training collar high, behind my ears, and give me a firm correction when I start popping off. Today after she gave me a correction I stopped popping off and I sat and looked up at her. That's exactly what she wanted! 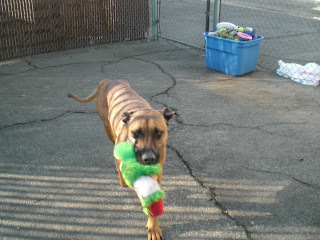 Susan wanted to take these extra pictures of me playing with my favorite green fuzzy squeak toy. She thought I looked extra handsome after she furminated me. And my sit and stay are progressing well. I don't whine and bark anymore when she makes me stay. 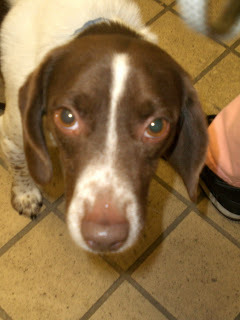 Hi, I'm Benny, and I'm a young tri-colored beagle mix in cage C218. I have a little chihuahua kennel mate. Tonight Susan the dog lady and I got acquainted for the first time and she took me out for a quick walk. Susan is amazed at how calm I remain when all the dogs are in a barking frenzy, and how easy I am to walk. Hi! 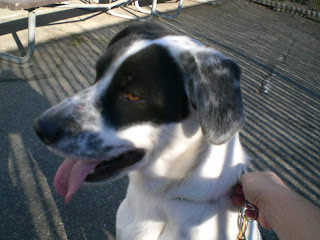 I'm Marty, and Susan the Dog Lady forgot to write down all the information on me, but she thinks I'm a pointer mix, and that I'm still a puppy (less than 2 years old). Next time she is here, she will get more information about me. Right now, I am in the building 2 cage furthest to the back on the west side. I'm very friendly, and not hard to walk. 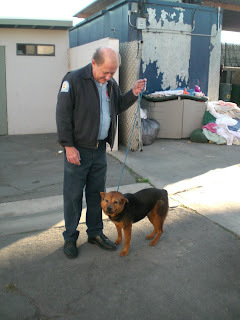 Susan was telling Tammy the animal control officer that she's getting very fond of pointer dogs! Hi! My name is Cindy. 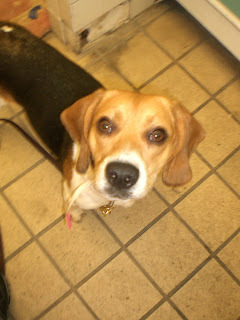 Susan the Dog Lady is putting up my pictures because she happens to be fond of beagles. She thought I was a real sweetheart. 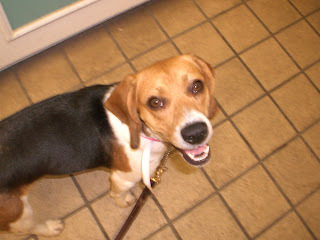 She is having second thoughts about adopting a beagle someday, because she's afraid she might spoil us! 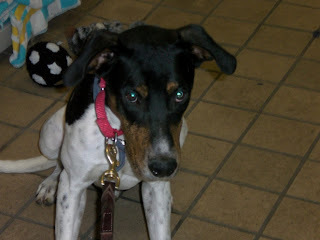 It turns out that even though I was owner-surrendered on December 11, I was adopted immediately. Susan encouraged a man with a young boy to adopt me. So hopefully I will be gone by the time Susan comes back. If I'm not, Susan will be sure to put up more information on me. 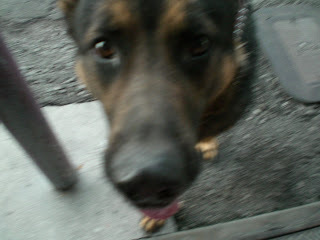 Hi, Rex again! My neighbors Beryl and Jojo appear to have been adopted (knock on wood)! Wish them luck, and let's hope we don't see them here again. Susan the dog lady took these pictures of me tonight and she thought they were much better than my prior photo. Susan is working on being firmer with me, because I do try to dominate her. Tonight we worked really hard on sit-stay. A few weeks ago she noticed that I have a tendency to growl if I think my toys are being threatened, and she body-blocked me from a toy so she could safely access it. Tonight I growled again and she did the same thing again. Then while she was sitting on the bench I laid myself against her legs and then tried to jump on her knee to be petted - but she knew that I was again trying to establish dominance with her, and she wouldn't allow it. Tonight she took me back into the laundry room and furminated me. She notices that I seem uncomfortable when she does that to me but she does get rid of a lot of loose fur. It's really difficult at this time of year to be able to play in the back because it gets dark so early. Susan is hoping she can wrap up work early this year to take some extra time off for Christmas, and hopefully spend more time with me and the other dogs down here! Let's hope she can get her work done!